Is It Hot In Here or Is It Just Me?? I can remember when my best friend would start talking about how hot it was, and she would get that sticky kind of feel to her skin. Since we were nowhere near the “women of a certain age” age, we thought she was really sick. Little did we know what we were about to encounter in the years to come. I was the lucky one. 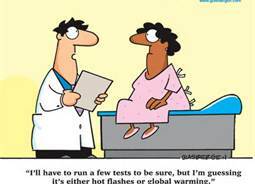 I never really had bad hot flashes, but I did have the sleepless night symptom. There were few night sweets for me, but my best friend would get her hair done and immediately have to go back the next day. I remember her calling the stylist and telling him she needed to come in before work. He told her he had just done her hair. When she walked in that morning too bright and too early, he immediately knew the reason for the visit. I have never been a person who likes to take pills, and I was blessed that I never really took hormones. Below is an article that may assist those that need a little more knowledge when it comes to hormone replacement. It was written by Julie Deardorff. For all of you who think that you are too young to read the article, my best friend started having hot flashes at about 35.